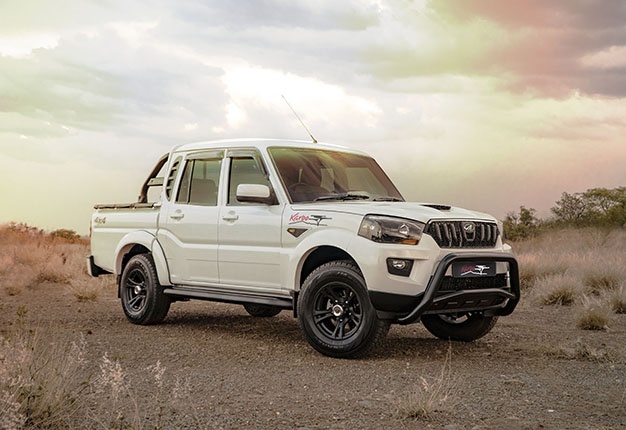 Mahindra South Africa is celebrating the first six months of local vehicle production as well as its sales growth in the South African market with a limited "Karoo" Edition of its popular Pik Up Double Cab. The Karoo Edition will not only celebrate these Mahindra milestones with additional accessories, but it heralds the introduction of the S6 specification level in the double cab range. In doing so, it has enabled Mahindra to offer a double cab at R299 999 for the 4x2 and R329 999 for the 4x4 version. "Over the past few years, the Pik Up has become one of Mahindra’s best-selling models, thanks to its combination of rugged and reliable mechanical underpinnings and a generous specification level," says Rajesh Gupta, CEO of Mahindra South Africa. "With the introduction of the S6 Double Cab Pick Up, we have amplified the Pik Up’s best qualities and made it available to more bakkie-buyers," Gupta adds. The S6 Pik Up double cab has the same specification level as the S6 single-cab models. The list of luxury specifications includes front fog lamps, colour-coded bumpers, and mirrors with side mouldings, remote central locking, a USB-enabled audio system, ABS brakes with electronic brake-force distribution, two airbags, a differential lock and power windows. "For the S6 Pik Up Karoo Limited Edition, we have added a tow bar, tonneau cover, a nudge bar and roll bar and Karoo decals. It has also added rain deflectors on the windows and wheel arch mouldings," says Hans Greyling, Head of Sales for Mahindra South Africa. The extras on the Karoo Edition tally up to over R28 000 of additional value, and this is added at no cost to the customer," Greyling adds. The Karoo Edition gets its name from the very popular locally filmed Mahindra advertisement where an adventure seeker moves heaven and earth to find a farmer’s lost lamb. This tongue-in-cheek ad has won Mahindra an advertising Orchid and has proven very popular among local bakkie owners. It also retains the S10 model’s 2 179cc mHawk common rail injection turbo diesel engine with 103kW at 3 750rpm and 320Nm at a wide band between 1 500rpm and 2 800rpm. Like its S10 siblings, it also has a 210mm ground clearance and a load rating of up to 1 095kg and it is fitted with a six-speed manual gearbox. Mahindra has also opted to retain the S10 versions’ 5-year / 90 000km service plan and 4-year / 120 000km warranty on the new S6 specification level. Service intervals, after the initial 10 000km lubrication service, is set at every 20 000km. The Mahindra Pik Up Karoo Edition is available immediately in limited numbers at Mahindra’s more than 60 dealers across the country.